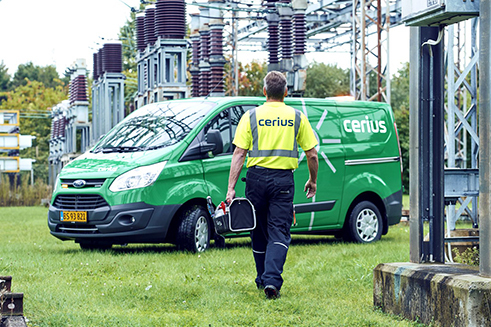 For the Danish utility and distribution system operator, CERIUS, the environment is a high priority. GE is helping them reach their goals toward a more sustainable future by reducing global warming caused by greenhouse gases (GHG), and particularly SF6, a very potent GHG that has 23,500 times the Global Warming Potential compared to CO2 and has a lifetime in the atmosphere of 3,200 years. GE’s SF6-free solution is the groundbreaking Green Gas for Grid known as g3, an environmentally-friendly alternative to SF6 as an insulating and switching gas in high-voltage (HV) equipment. While keeping the same efficiency, it has a considerably lower impact on the environment, thus fully supporting CERIUS’s green vision. CERIUS has ordered six bays of F35-72.5 kV g3 gas-insulated substation (GIS), including a circuit-breaker bay, for its Haslev substation in the south of Sjaelland, located 60 km from Copenhagen. The substation is supplying power to more than 11,000 people. When asked about the reason why CERIUS choose g3 instead of SF6, it was obvious that g3 was the right solution: “SF6 is an aggressive greenhouse gas and is commonly used in HV equipment. We would like to be at the forefront of testing this alternative.” This is demonstrated by achieving a significant reduction of CO2 emissions with 1,850 tons of CO2-equivalent not entering the atmosphere, it is a reduction of more than 99%. In order to support its strong environmental focus and greenhouse gas policy, Denmark has put in place a high tax on SF6 import (80 € per kg): “g3-alternative from GE’s Grid Solutions was the most technically and economically optimized solution for our project” stated Jimmi Hvass Marcussen, CERIUS Team Leader. In addition, the project has created development in the region and improved quality of life for CERIUS’ customers and stakeholders. This is an important goal for CERIUS who takes this responsibility toward future generations very seriously, endorsed by GE. CERIUS’s trust in g3 has been proven to be the right solution for their challenge. Satisfied by GE’s SF6-free GIS and the execution of their first g3 project, Cerius has just placed a second order for eight F35 bays for their Naestved substation, confirming their confidence in GE’s Grid Solutions SF6 alternative gas.